An equation which can be put in the form ax + by + c = 0, where a, b and c are real numbers and both a and b are nonzero is called a linear equation in two variables. 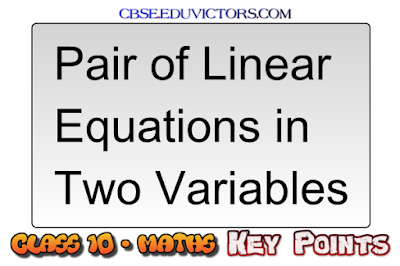 Each solution (x, y) of a linear equation in two variables. 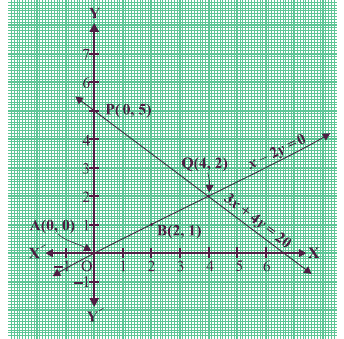 ax + by + c = 0, corresponds to a point on the line representing the equation, and vice-versa. The solution is (4, 2), the point of intersection. - The lines may intersect in a single point. In this case, the pair of equations has a unique solution (consistent pair of equations). - The lines may be parallel. In this case, the equations have no solution (inconsistent pair of equations). Find the value of one variable, say y in terms of the other variable, i.e., x from either equation, whichever is convenient. Substitute this value of y in the other equation, and reduce it to an equation in one variable, i.e., in terms of x, which can be solved. Sometimes, you can get statements with no variable. If this statement is true, you can conclude that the pair of linear equations has infinitely many solutions. If the statement is false, then the pair of linear equations is inconsistent. Substitute the value of x (or y) obtained in Step 2 in the equation used in Step 1 to obtain the value of the other variable. First, multiply both the equations by some suitable non-zero constants to make the coefficients of one variable (either x or y) numerically equal. Then add or subtract one equation from the other so that one variable gets eliminated. If you get an equation in one variable, go to Step 3. If in Step 2, we obtain a true statement involving no variable, then the original pair of equations has infinitely many solutions. If in Step 2, we obtain a false statement involving no variable, then the original pair of equations has no solution, i.e., it is inconsistent. 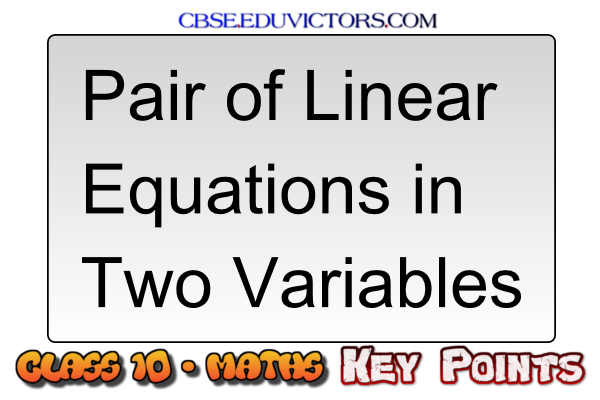 Solve the equation in one variable (x or y) so obtained to get its value. Substitute this value of x (or y) in either of the original equations to get the value of the other variable.